You will need 10 skewers for this recipe. If using bamboo skewers, soak them in water first. 1. Combine all the chicken ingredients in a bowl, and using your hands, massage to coat the chicken thoroughly in the mixture. Cover and marinate in the fridge for at least 2 hours. 2. For the jalapeno jam, add the olive oil to a large saucepan and place over medium-low heat. Once warm, add the capsicum, onion and jalapeno and cook, stirring often, for 20 minutes or until soft. Add the sugar and apple cider vinegar and cook for a further 20 minutes or until the liquid has reduced to a jammy, syrup-like consistency. Adjust seasoning to taste. 3. Remove from heat and allow to cool before adding to a blender and pulsing briefly until a relish consistency. Reserve ¾ cup for use, then scoop the remaining relish into jars and seal tightly (jalapeno jam will keep for up to one month in a jar in the fridge). 4. Heat a griddle pan or char-grill pan and grill the corn until charred all over (about 12 minutes). Using a sharp knife, slice the kernels off the cob straight into a bowl. Allow to cool then add the grated manchego cheese and chopped coriander and set aside until ready to serve. 5. Preheat the oven to 220C. Line a large baking tray with baking paper. 6. Place a large frying pan over medium-high heat. Add the chicken, in batches, and cook for 1 to 2 minutes each side – you want it to caramelise and char. Remove from heat and as soon as the chicken is cool enough to handle, pierce the meat onto the skewers. 7. Place the skewers on the prepared tray and bake in the oven for 15 minutes or until cooked through. While it seems fiddly, this step ensures your chicken is caramelised and evenly cooked. 8. 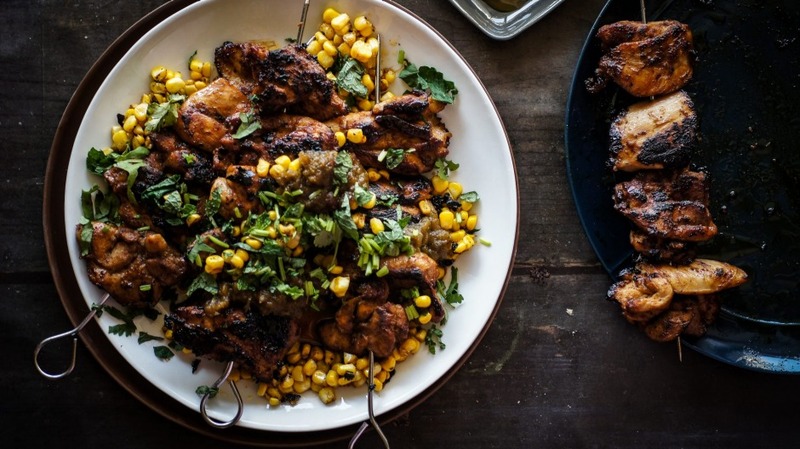 Remove chicken from the oven, place skewers on a large serving platter, scatter over the corn and herb mixture and generously dollop with jalapeno jam. Serve with warm flatbreads, if using.